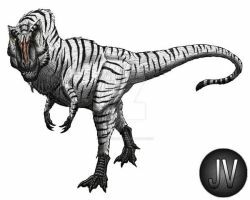 The first large theropod known from a reasonably complete skeleton. 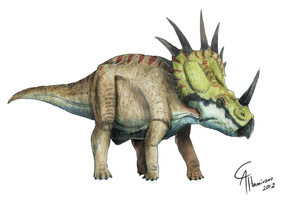 Though the notable horns adorning its skull are now thought to be purely ornamental, Marsh originally described them as "a most fearsome weapon." This is awesome the colors are so vibrant and look something like that of some Anole lizard. You know another good meaning for it's name would be "Chief Horned Lizard" from what information I looked up. Your drawing are awesome! What do you use to draw/paint? 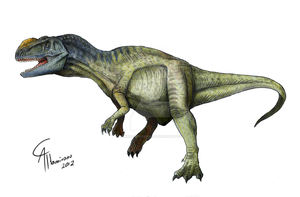 Ceratosaurus, the dinosaur who was on fire! LOVE the colors. Love love love. I love your bold color schemes.